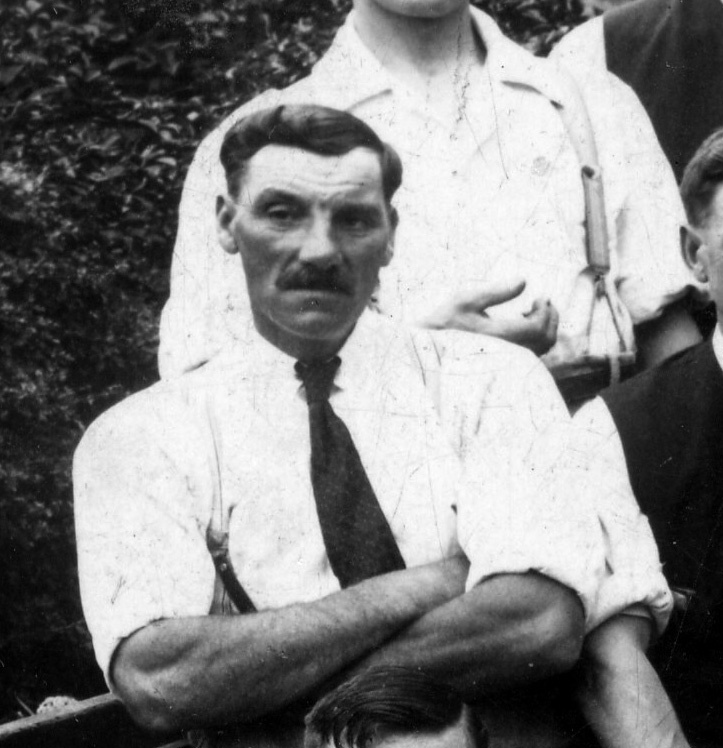 John William KIrton c.1930, taken from a picture of the Bottesford British Legion bowls team. The bellringers at Bottesford St Mary's on Coronation Day, 1911. 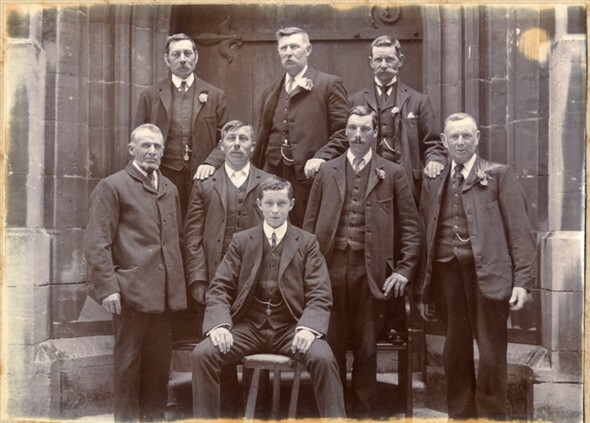 Back row standing L-R: Reuben Bend, Samuel Baker, Harris Thorlby. Front row standing L-R: Daniel Gilding, Arthur W Ward, John W Kirton, Mark Bend. Front seated: Charles Lamb. John William Kirton was the oldest of five sons of John and Ann Kirton of Easthorpe to serve during WW1. The others were Isaac, Robert Johnson, Frank and Tom. He may have been recruited into the Training Reserve in 1918, but this is not entirely certain. John William Kirton, born in 1884, was the oldest son of John and Ann Kirton. John, his father, was born at Easthorpe in 1855, and his mother, Ann (neé Johnson), at Gelston, Lincolnshire, in 1862. Theirs was a large family. Ten children are known from the Censuses: Eleanor (b.1883), John William (b.1884), Isaac George (b.1886-1968), Lucy Ann (b.1888), Robert Johnson (b.1891-1969), Sarah (b.1893), Frank (b.1894-1963), Tom (b.1896-1991), Edward Henry (b.1902) and Catherine (b.1903). In 1891, when John William was six years old, and again in 1901 and 1911, his family were living on Belvoir Road, Easthorpe (known as Castle View Road today). His father was employed as a railway carpenter. John William Kirton married Alice Eyre, from ‘Nuncargate’ in Nottinghamshire, in 1908 at Grantham. In the 1911 census, they were living on Belvoir Road in Bottesford, where they had two infant sons George William, born at Muston in 1909, and Reginald, born in Bottesford in 1910. John was a railway platelayer. Though the records are not entirely certain, it is possible, on the basis of military records found on line, that John William Kirton was conscripted, enlisting on the 3rd of February, 1917, as Private 3/1789. He joined the 48th Training Reserve Battalion. Previously known as the 9th (Reserve) Battalion of the Shropshire Light Infantry, the 48th TRB formed part of the 11th Reserve Brigade, and was based at Prees Heath. It is uncertain if this John William Kirton was posted to the Shropshires, or any other regiment, before he was discharged almost a year after joining the 48th TRB. On the 9th of December, 1917, he was discharged due to injury, and issued Silver War Badge, No. B229726. No details of his injuries or other information have been discovered. More importantly, there is some question as to whether this military record applies to the John William Kirton from Easthorpe or to some other soldier of this name. This doubt has arisen because there was a report in the Grantham Journal, on the 16th of March, 1918, of J.W. Kirton playing his part as a Bottesford bell-ringer. To mark the installation of the new Rector, Frank Walford, there was a peal of grandsire triplets, with 5040 changes, lasting three hours twenty one minutes, in which J.W. Kirton rang the tenor bell. Later in the year, on the 1st of June, the Journal reported that J.W. Kirton had been elected Honorary Secretary of the newly formed Bottesford branch of AL-RWU (Agricultural Labourers and Railway Workers Union). Does mean that his attendance at the TRB training camp was delayed or only periodic, or that the man who joined the TRB was in reality some one else of the same name? The record in the 1939 Register gives John W. Kirton, a railway ganger born on the 2nd May 1884, and Alice Kirton, born on the 21st June 1888, at Blue Bank, Grantham Road, Bottesford. Also at home were John Ian Kirton*, a farm labourer born on the 9th May 1919, and James A Kirton, a poultry hand born on the 2nd December 1923, presumably their younger sons. Both John and Alice died in 1969 in the Melton district. *Tina Perkins is thanked for pointing out that there is an error in the 1939 record, and that the name should have been John Tom Kirton. This is a provisional record pending further information.